Here is a Gorton (Famco Gorton, Lars) 3NS collet set #1210-1 with the very RARE K-6094 Adapter. The 1/8" collet is missing but there are two 3/8" collets. The K-6094 Adapter is used to hold taper shank single point engraving tools; I believe that it has a #1 Brown & Sharpe taper. Some of the collets have grinding nicks on their faces but are otherwise fully functional. This is not surprising since this set is used on the Gorton 500 CG cutter grinder (500CG). 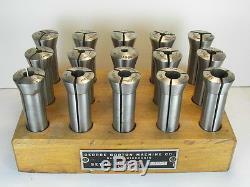 The collet bores are in good condition; there is scattered darkening from age. No source exists for the K-6094 adapter. They've been sitting in my shop for over 20 years; I never came across the cutter grinder so it is time for them to go. 100 1/8 is missing 5/32 3/16. 200 7/32 1/4 9/32 5/16 3/8 (2 pcs) 7/16 1/2 K-6094 Thanks for looking. 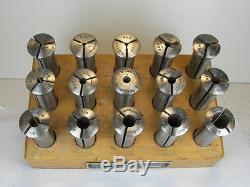 The item "Gorton 3NS Collet Set 1210-1 15 Pcs w RARE K-6094 Engraving Tool Taper Adapter" is in sale since Thursday, August 21, 2014. This item is in the category "Business & Industrial\Manufacturing & Metalworking\Metalworking Tooling\Workholding\Collets". The seller is "prirexcess" and is located in Princeton, New Jersey.